Norwegian mass murderer Breivik shocks courtroom as he calmly describes hunting down teenagers on an island summer camp last July. Norwegian mass murderer Anders Behring Breivik shocked an Oslo courtroom Friday as he calmly described hunting down teenagers on an island summer camp last July. Earlier, attendees at the trial were warned that Friday would likely the “the hardest day” yet. As his words rolled out, survivors and victims' relatives of the July 22 massacre hugged and sobbed, trying to comfort each other, The Associated Press reported. According to the report, the 33-year-old Norwegian left out no detail from his rampage, explaining how he shot panicked youths at point-blank range. 69 people, mostly teenagers, were killed on Utoya island and others only survived by diving into chilly waters to escape. Looking tense but focused, Breivik spoke calmly about the shooting rampage, beginning with the moment he took a small ferry to Utoya, an island in a lake outside Oslo. He was disguised as a policeman, carrying a rifle and a handgun. He also said he brought drinking water because he knew he would get a dry throat from the stress of killing people. “My whole body tried to revolt when I took the weapon in my hand. There were 100 voices in my head saying ‘Don't do it, don't do it,’” Breivik was quoted by AP as having said. He said he then pointed his gun at Berntsen's head and pulled the trigger. He shot Boesei as she tried to run away. Then as they lay on the ground, he shot them both twice in the head. Breivik said the first shot was “extremely difficult,” but he then entered a “fight-and-flight modus” that made it easier to continue the killing spree. He said some teenagers were frozen in panic, unable to move even when Breivik ran out of ammunition. He changed clips. They didn't move. He shot them in the head. Breivik recalled continuing his rampage around the island, luring youth from their hiding places by telling them he was a police officer who was there to protect them. When they came out, he gunned them down. Breivik has already admitted to setting off a bomb on July 22 in Oslo, killing eight people, before opening fire to the governing Labor Party's annual youth camp on Utoya island. However, he has pleaded not guilty to criminal charges, saying his victims had betrayed Norway by embracing immigration. He earlier told the Oslo court that if Norway had adopted a “Danish level” of cultural and immigration policies, he would never have committed his massacre. 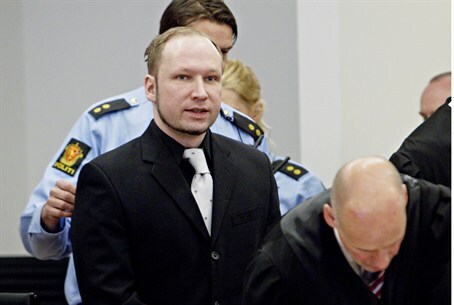 The main goal of the trial, now in its fifth day, is to figure out whether Breivik was sane or insane during the attacks. To official reports have come to opposite conclusions on that point. Earlier this week, Breivik said his original plans called for attacks on numerous government targets, including the Royal Palace. In the fourth day of his trial Breivik he had originally intended to attack Oslo's government district, the Labor Party's office and a third target, and the royal palace. He testified that he decided against multiple bombs because building one was "much more difficult than I thought."